Alpha Omega (AO) has a long history of dedication to the ideals of high ethical standards and high levels of professionalism. Included in these ideals is recognition that what makes a well-rounded professional is devotion to others through giving back to the world. In response to the wonderful lives we are privileged to lead, a consummate professional donates time and money to causes that improve the world as we know it. The program focuses on providing care for the financially most needy individuals who are served by the Holocaust Survivor Assistance Programs administered by the network of Jewish Family and Children’s Service agencies and other entities, as well as individuals of any faith who are survivors of Nazi persecution. 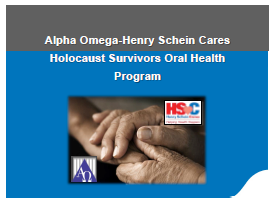 Read: "HENRY SCHEIN AND ALPHA OMEGA INTERNATIONAL DENTAL FRATERNITY ANSWER THE WHITE HOUSE'S CALL TO ACTION TO ENHANCE THE QUALITY OF LIFE OF HOLOCAUST SURVIVORS"
You can donate to this fund directly from our Donation page. In November 2014, Marlene Tenenbaum, spouse of Montreal Frater and Past International President Michael Tenenbaum, passed away after a valiant fight against cancer. Marlene was always a supporter of Alpha Omega, from the chapter level all the way to Michael's presidential year. At Michael's request, a special fund has been established by the Alpha Omega Foundation of Canada in Memory of Marlene Tenenbaum with money going to the Holocaust Survivors Program. As Michael's parents were both Holocaust survivors and with Michael and Marlene's deep commitment to Alpha Omega it is fitting Michael initiated this fund in memory of his beloved Marlene. If you would like to donate to this fund please click on the link below. Canadian donor's money will be channeled to the Canadian Foundation and American donors' money to the US Foundation. 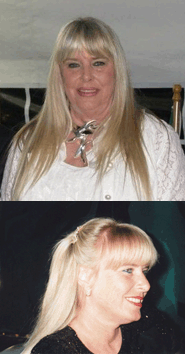 On November 21, 2014, Alpha Omega lost Marlene Tenenbaum after a long and difficult struggle with cancer. This was a tremendous loss for the AO family and a tremendous personal loss for Bill and me. The Tenenbaums and the Steinmans traveled together to almost every Alpha Omega convention over the last twenty years. What wonderful things we saw and times we had. Our children adored her and she them. Our daughter Amy was especially close with Marlene, going on shopping trips and sharing AO Kids Camp secrets. All the kids flocked to her. They knew they could confide in her and trust the advice she gave. When Mike was International President, Marlene revelled in the role of First Lady. She was a model ambassador and hostess. Mike and Marlene were devoted to each other. They were a team. Rarely do you see a couple who look after each other the way they did. They had a deep commitment to one another, a deep commitment to Alpha Omega and to every one of us. 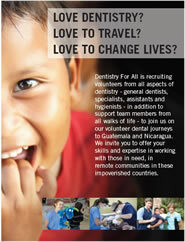 Dentistry For All is recruiting volunteers from all aspects of dentistry - general dentists, specialists, assistants and hygienists - in addition to support team members from all walks of life - to join us on our volunteer dental journeys to Guatemala and Nicaragua. We invite you to offer your skills and expertise in working with those in need, in remote communities in these impoverished countries. 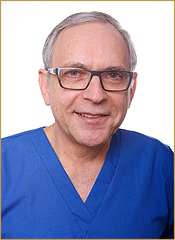 For more information visit The Dentistry For All website at http://www.dentistryforall.org. Montreal to show support for a fellow Alpha Omegan. His warmth and compassion were infectious and so started a long distance friendship that went beyond AO: to build upon his desire to strengthen our organization as a place where the triangle of Judaism, Fraternalism, and Professionalism had real meaning. Sitting together on the International Board years later, Terry served as the voice of reason and practicality. He coined the phrase "AO is tattooed on his heart" and indeed, he truly felt that way. He shunned the spotlight. My only disagreement with him was when he insisted that I, not he, run for International Treasurer even though I felt he was more highly qualified. During my respective board roles as Treasurer and President, I turned to him for advice. The Terry that many of us admired was focused, intelligent, knowledgeable, but humble and soft spoken. 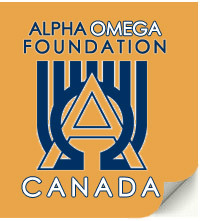 We are proud to establish the Terry Shapero Memorial Fund in the Canadian Alpha Omega Foundation. Funds collected will be dispersed annually to charities that were close to Terry's heart and with his true tradition to make the world a better place to live. The Montreal alumni chapter of Alpha Omega named its tribute fund after a respected member of its chapter, the late Dr. Howard S. Katz. 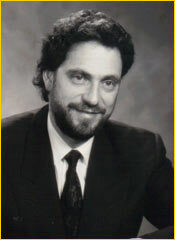 At the time of his death Dr. Katz was the associate dean of academic affairs for the faculty of dentistry at McGill University. He was loved and respected by his students for his devotion to their professional development and his consideration of their individual needs. The fund is intended to provide financial support for undergraduate dental students who are members of the Montreal student chapter of Alpha Omega who volunteer to participate in global dental health initiatives. Applications for grants from the fund should be directed to the Montreal Alumni chapter president. Individuals who receive a grant are expected to provide a written report of their volunteer experience and give a presentation at an alumni chapter meeting.